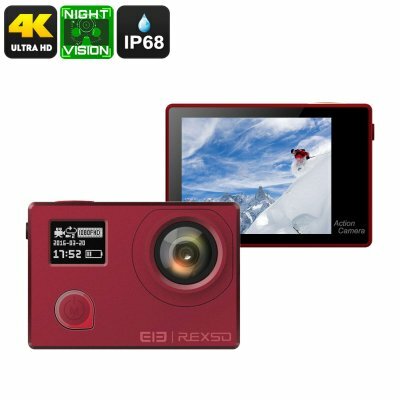 Successfully Added Elephone REXSO Explorer 4K Action Camera - Sony IMAX Sensor, Night Vision, IP68, Dual-Display, 4K, 16MP Picture (Red) to your Shopping Cart. The Elephone REXSO Explorer is an ultra-thin sports action camera that lets you shoot mesmerizing video and images. Thanks to its compact design, this little 4K camera can be carried along easily anywhere you go. It comes with an abundance of clips and hooks – making it easy to attach to your equipment. Thanks to its IP68 waterproof case, you’ll be able to use it in all environments. Whether you’re into diving, mountain biking, skiing, or skydiving – this 4K action camera follows you anywhere you go. It comes with a 1050mAh battery that lets you record for an hour straight. This beautiful sports action camera comes with the Sony IMAX 179 sensor and features a 6 glass lens. Additionally, it features the MTK 96660 chipset and supports a 170-degree recording angle. Thanks to this, you’ll be able to capture breathtaking video and images at 4K resolutions. When used as a regular photo camera, it lets you snap detailed pictures at 16MP. With this 4K action camera at your side, you’ll be able to take the perfect photographs and films alike of all your upcoming adventures. Thanks to its WiFi and App support, you’ll be able to easily share all recordings instantly onto your smartphone. Additionally, they can be saved onto a 64GB SD card. What really sets this remarkable action camera apart from most others is the fact that it supports starlight night vision shooting. Thanks to this, you can even use this sports action camera after dark. It supports different shooting modes to make sure it meets your personal recording demands. Additionally, it has two LED displays that include a large 2-Inch display at the rear and a miniature 0.66-Inch display at the front. This allows you to easily browse through all its features whilst bringing along great usability. The Elephone REXSO Explorer action camera comes with a 12 months warranty, brought to you by the leader in electronic devices as well as wholesale sport cameras..